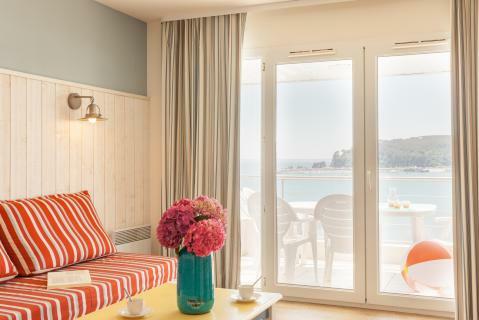 Pierre & Vacances Résidence Cap Morgat in Crozon Morgat - the best offers! Enjoy a historic holiday at Pierre & Vacances Résidence Cap Morgat, which was built on an ancient fort overlooking the Atlantic Ocean to give you a truly unique experience. This price applies to 5-person apartment 1 bedroom (max. 4 adults) standard, with the arrival as 6 May 2019, 2 Nights. This price applies to 7-person apartment 2 bedroom (max. 6 adults) standard, with the arrival as 29 April 2019, 2 Nights. Pierre & Vacances Résidence Cap Morgat is situated in the Armorique nature park and is built on a small fort that beautifully positions the building to overlook the Atlantic Ocean. 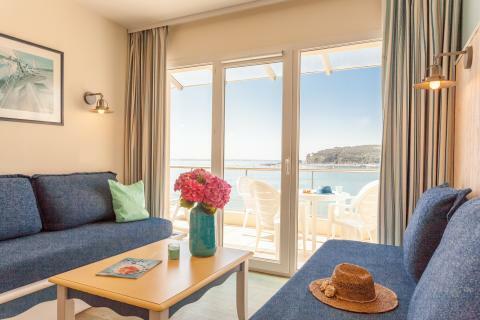 All the accommodation includes either a balcony or a terrace which gives the building a natural and peaceful light. The residence has a heated outdoor pool that is open from June to late September with a sandy beach only 100m away making it convenient for guests. Sport enthusiasts can take advantage of the water sports centre 3km away or have a family-fun day with horse riding and bike rides. Children can enjoy themselves in in the outdoor pool or by the nearby sandy beach of Morgat which is 300m away. The bay is sheltered which means that the beach is a safe swimming location for children. There is also a designated kids play area within the résidence as well as comics and board games which can be borrowed for some indoors entertainment. Treat yourself to a fresh breakfast in the morning with the bread and banquet service which you can request at the reception the evening before. Although the résidence does not have its own restaurant, there are numerous restaurants that you can choose from in the harbor and around the beach area. Tip: Get French crêpes on the beach at Crêperie Atao Aman. The Morgat beach is known as one of the most beautiful beaches in France. During the low tide, the whole family can walk along the beach and even take a boat trip to explore the sea caves of the island. If you are looking for some adventure outside the residence area, World’s End Festival takes place every August in Crozon and is a multi-cultural music festival, an activity that the older children would enjoy.